Say hello to HelloMix! This fascinating theme really stands out from the rest. A clean and sophisticated design, perfect for an electronic, gadgets or sports and fitness store. Includes a completely customizable homepage slider, showcasing all your beautiful products, plus our great featured product slider! Once again, say Hello to HelloMix! 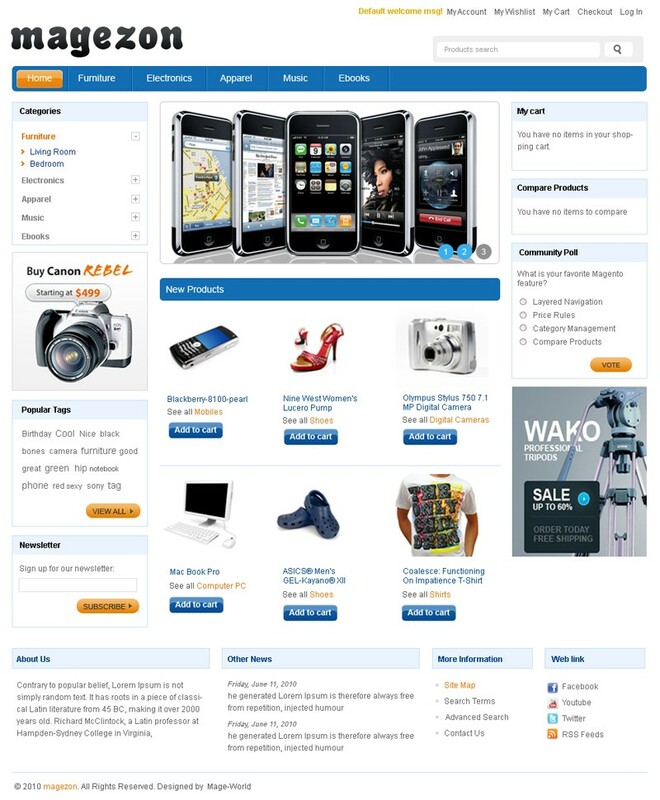 With the purpose of support your e-business for free, Mage-World is glad to introduce new free theme Magezon. The saying “Simple is the best” is pretty right on Magezon. This theme attracts all viewers with its plain but efficiency, focuses on products show and displays functional modules clearly. 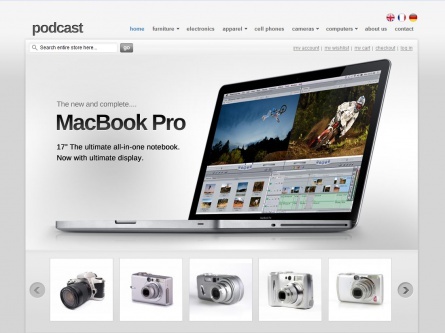 It provides customers an ease when visiting a webshop with clear lay-out like this. Included is a great looking banner and very customizable sub pages. Plus with that, this theme is HTML & CSS validated carefully by our experienced experts. More importantly, Magezon is fully compatible with Magento version 1.4. Also, it is very easy to install, easy to use and edit. Say hello to HelloPress! With its tri-colour scheme, a simple layout and easy on the eye theme is aimed at the ‘new age’ shoppers. Well suited for technology based online shops, simple to navigate with plenty of space for pictures of the products to sell themselves. As with all HelloThemes products HelloPress comes with the Extensions to keep your e-business upto date. Once again, say Hello to HelloPress! The development of technology has increased the number of hi-tech products as well as the variety of hi-tech web-shop. In order to catch up the trend and meet customers’ need, MageWorld launches mTech along with mApple and mHitech being released some months ago. 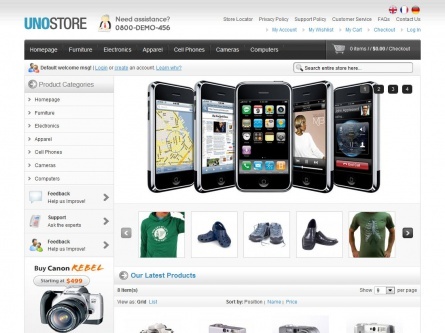 This Magento theme for Mobile store attracts customers by its featured products slideshow and clear pictures. Furthermore, every details of the products including price and functions is showed up clearly that raise the product’s values and make the customers buy it right away. Another advantage of mTech over other themes is provided with two different skins. Say hello to HelloPodcast! As the name suggests, this theme is aimed very much at the ‘ipod’ generation, with its clean, clear and easy to operate functions, HelloPodcast is sure to catch the attention of the next generation of shoppers. Features include, completely customisable frontpage gallery slider on frontpage to showcase latest products or special offers. Once again, say Hello to HelloPodcast! 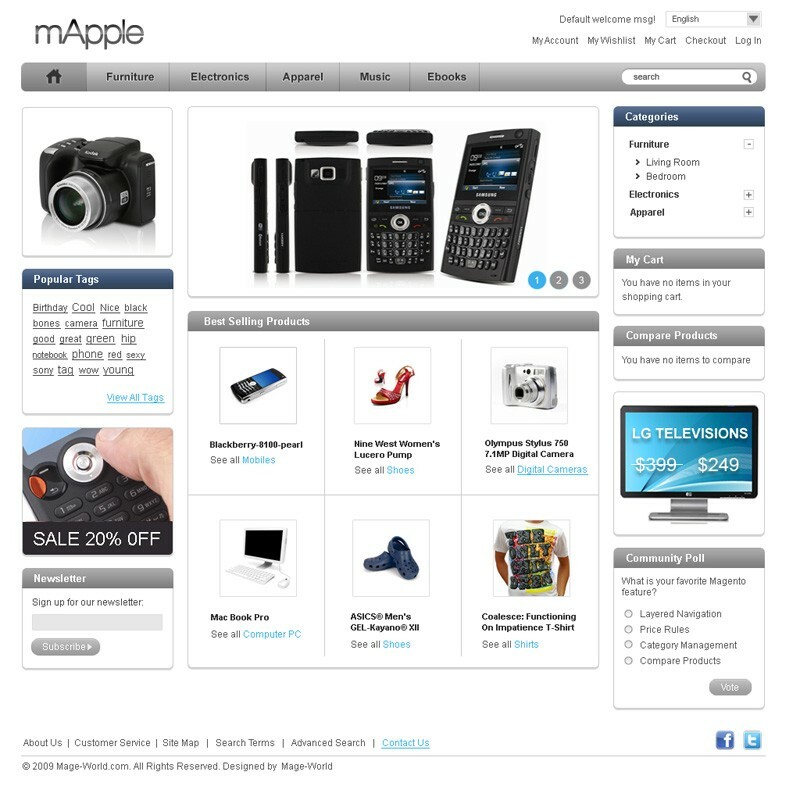 With the purpose of support your e-business for free, Mage-World is glad to introduce new free theme mApple. This Magento theme has the advantage of clean and clear design which is suitable for wide variety of products. mApple is a basic magento theme allowing you to show products in the middle of the page, and functional modules on two sides. 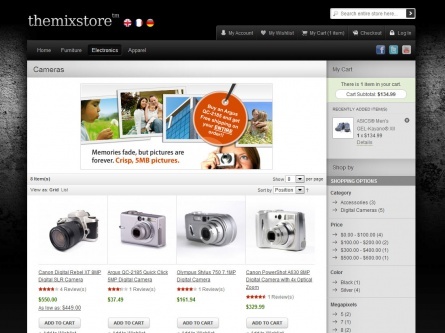 It provides customers an ease when visiting a webshop with clear lay-out like this. Included is a great looking banner and very customizable sub pages. Plus with that, this theme is HTML & CSS validated carefully by our experienced experts. More importanly, mApple is fully compatible with Magento version 1.4. Also, it is very easy to install, easy to use and edit. Say hello to HelloUno! 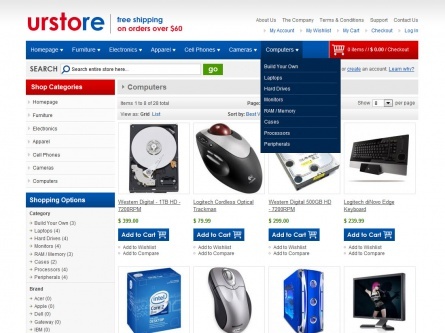 This beautifully designed theme is suitable for any type of store. Has a sophisticated design, which sort of gives it an upto date appeal. 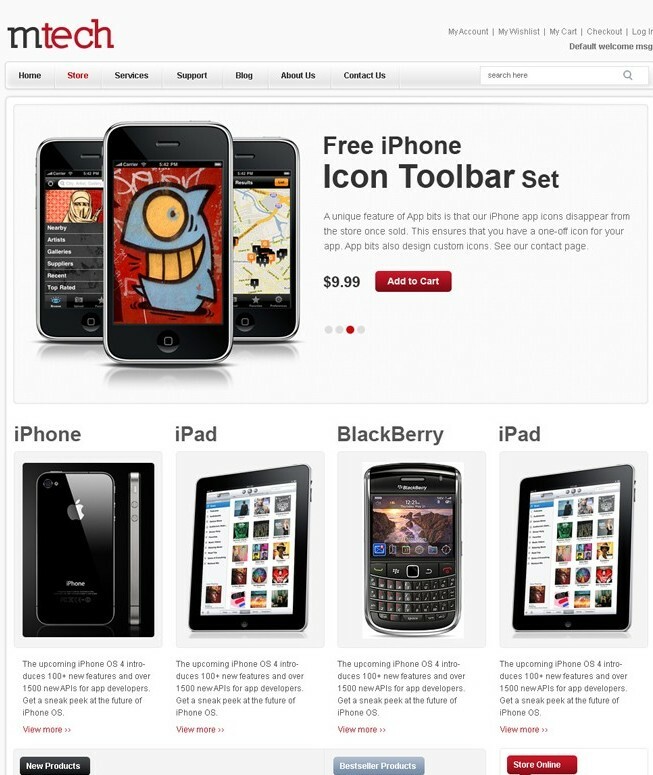 Includes a completely customizable homepage slider, showcasing all your latest products and offers. Once again, say Hello to HelloUno! Say Hello to HelloCanvas! This informative theme gives you the space to fully inform the customer of the products features and benefits. HelloCanvas has a social content feature which allows fans to keep updated with all recent events and new products. Once again, say Hello to HelloCanvas! 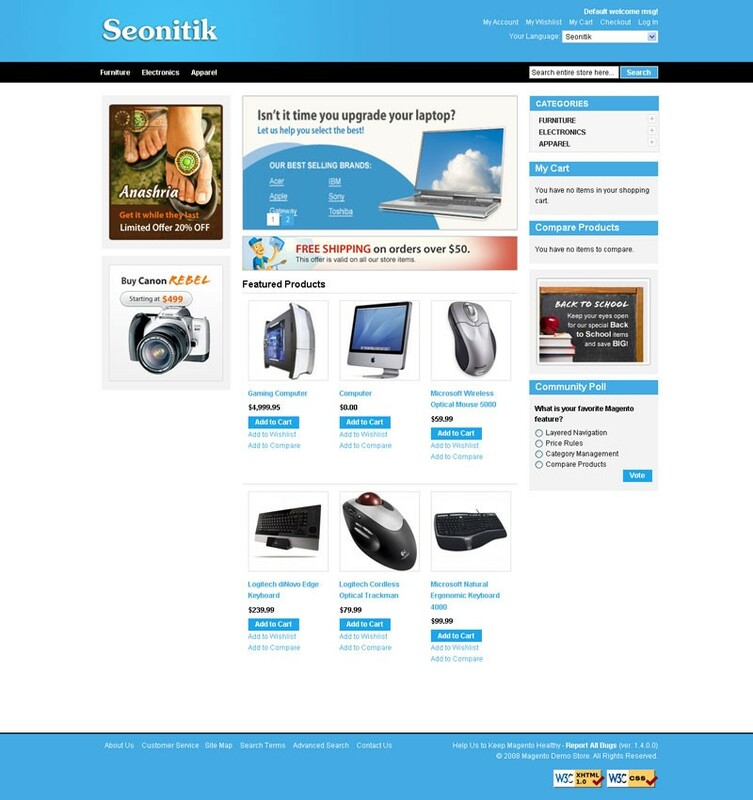 Seonitik is a basic theme with simple and clean look used for ecommerce site. This Magento theme is suitable for any kind of webshop. Moreover, it is HTML & CSS validated carefully by our experienced experts. In addition, it is also easy to work with and edit. Mage-World is pleased to inform that new free theme mEbay is now available after two week wait.It is a basic magento theme with clean look and user friendly performance. 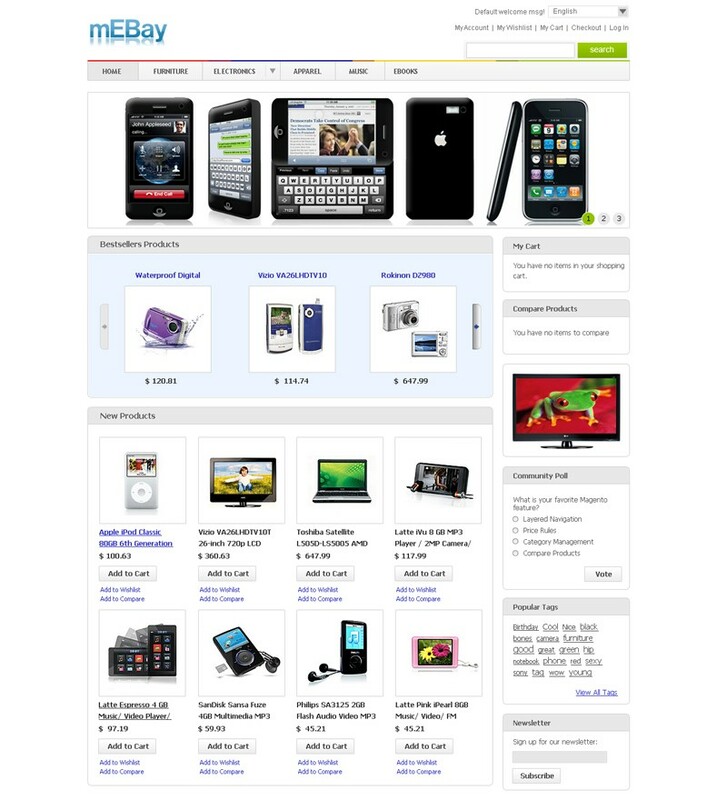 Get the inspiration from one of the world leading online auction and shopping website, eBay, we have designed this free theme with the aim of bringing customers great shopping experience. It is promisingly suitable for any kind of magento web-shop. In addition, completely customizable sub pages are included.